We are generally big fans of Fogcreek (we even have the teeshirt!). Generally they produce products which hit the sweet spot of being affordable, very well-designed, professionally supported and great at making us more productive. 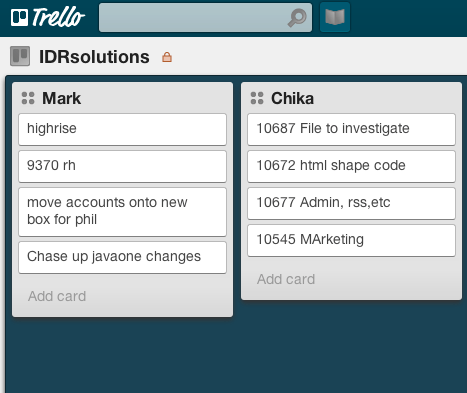 Trello is a very slick web application for lists. It runs in a Browser and you can invite anyone to join your board. Your board can contain lists and you can add items to each list. I use lists to organise my day and I have already switched from my Notepad list to Trello – everyone can see my lists, and I can reorder or drag items between lists very easily. As well as list for my todo list, I have lists for meetings and various projects. Everyone can see these (and the view updates in real time as someone changes). I have been experimenting with using it for alsorts such as our todo lists. Items on lists also act a little like cases in Fogbugz – I can link them to people, attach files and notes. A history is also kept of all activity. I do not think Trello can replace Fogbugz but it is a very slick tool for general organisation (much more intuitive and easy to use). I think Joel could have another winner on his hands! Can we have fogbugz integration? I would love a frontend in Fogbugz like Trello because it is so easy and intuitive. It would be wonderful if I could populate a List with a filter from Fogbugz (like todays cases or unassigned) and manipulate them in Trello mode. As you can probably tell, I am very impressed. 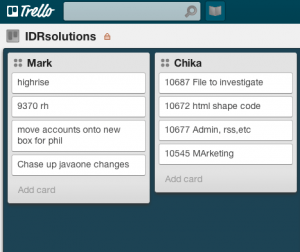 What do you think of Trello? I agree with you. Trello is very cool. I’m looking forward to using it at work as well as managing some of my many current home improvement projects. The only annoying feature I have found is that it is easily to accidentally archive an item because there is only one menu list.